Top Achievers 2017 Destination REVEALED! Are you ready to be a Top Achiever in 2017? The competition has kicked off and the incredible destination has been revealed – join us in the heart of the South Pacific, Fiji. Expect sparkling, clear waters, white sandy beaches and a brand new luxurious resort that will provide the perfect backdrop for exclusive business training and collaboration with fellow Isagenix Top Achievers. There are six ways you can earn your spot to this incredible experience. Those who finish in the Top 10 Overall Income Earner or the Top 10 Overall Leader In Action during the qualification period will earn an incredible prize package that includes airfares, accommodation and a Top Achievers 2017 event ticket. Well, it gets even better. This opportunity isn’t only open to those who earn a Top 10 Overall Income Earner or Top 10 Overall Leader In Action spot. If you’re yet to rank advance to 4 Star Golden Circle, here’s one reason why you need to! Those who advance in rank to 4 Star Golden Circle or above for the first time during the qualification period will earn an exclusive invitation to Top Achievers 2017, accommodation AND an event package (airfare not included)! That’s not all! There’s also the opportunity for Platinum and Millionaire businesses who don’t finish in the Top 10 Overall Income Earner or the Top 10 Overall Leader In Action categories to earn their exclusive invitation to the event. 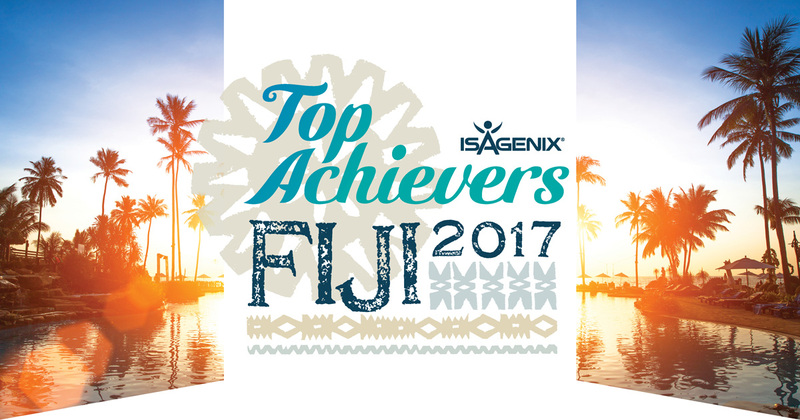 With so many ways to qualify and earn your spot to the heart of the South Pacific, Top Achievers 2017 is sure to ignite your passion and motivation. Top Achievers is the perfect opportunity to celebrate a successful year. Check out the flyer here to see the various ways you can qualify to earn your spot! Open to Australian and New Zealand Active Associates only. Participation constitutes your full and unconditional agreement to these terms and conditions and any promotion rules, FAQs or guidelines posted and the decisions of Isagenix, which are final and binding in all matters related to the contest. One prize per will be awarded per qualifying account, however each account is eligible to bring a business or romantic partner for a nominated fee. Qualifying Associates will be responsible for incidentals and other fees and costs. All winners must have a valid passport and are responsible for their own visa for travel to Fiji (if applicable). All dates and times shown are US EST. Prize is not transferrable, non-refundable and cannot be redeemed for cash value. Flights must be redeemed with the Isagenix travel agent. Contest rules are subject to change. Isagenix reserves the right to audit, adjust or deny any volume, compensations, recognition or other incentives awarded during or as a result of this contest to ensure the spirit of the contest is achieved. Associate enrolments and product orders that are deemed, at the sole discretion of Isagenix, to be solely for contest advancement may not be counted in the contest. All members are subject to standard compliance reviews both during and after the close of the contest; prizes may be withdrawn by Isagenix at any time. Any person who attempts to manipulate the Compensation Plan or the contest, or who otherwise attempts to circumvent the rules, forfeits any and all rights to receive any prize and will be disqualified from the contest. Rewards may be recouped in the event of refunds of product sales used to qualify for the contest.